Faça um teste com seus estudantes na Internet e analise os resultados estatisticamente. Run a test with your students on the Internet, and analyse the results statistically. WebQuiz is a program to solve quizzes online on the Internet or on a Intranet. It runs on a Internet server. WebQuiz has been developed to be used together with QuizPro. WebQuiz uses the same format for the question files and the data base. Create your own quizzes with QuizPro and publish them on the Internet by using WebQuiz. The results of the questioning is stored in a database, which can be imported by QuizPro, and therefore analysed statistically. You can use either multiple choice or fill-the-blanks questions. More then one correct answer is allowed. It is possible to build timed tests and even add sounds or graphics to quiz items. 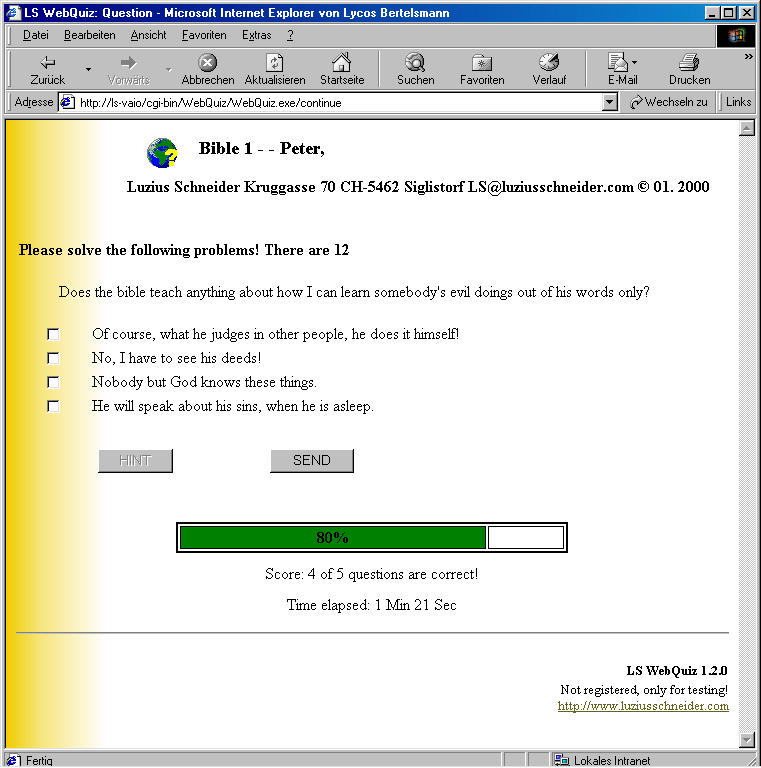 Sample tests on Bible knowledge and Greek are included. As QuizPro, WebQuiz allows you to repeat only the questions you did not know before. A results table may be shown after a completed quiz. You may show feedback about your score and answers. Multilingual. WebQuiz is a compiled application and not a script. Construa a HTML e site de XML traça para sua web chama, automaticamente ftp os resultados.